Hurricane off the shore of the U.S.
October 2, 2017—-In the many years since global warming and climate change became recognized as a global problem, it has been forecast that severe storms would become more severe. The severity of hurricanes in the 21st Century supports this forecast. 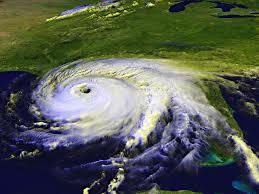 Hurricanes occur in many parts of the world’s oceans and go by different names in different regions. 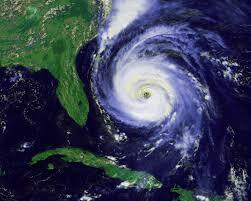 In the North Atlantic and South Atlantic Oceans, they are called hurricanes. 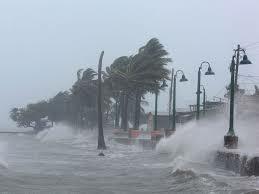 In the North Atlantic, the hurricane season runs from June 1 to November 30 and most hurricanes occur during this period. In 2017, the first storm to reach hurricane strength was Arlene on April 19, well before the normal season begins. It was only the second named storm to occur in April since records began. This year, in 2017, is the first time that two hurricanes of category four reached the United States. Both of these were Atlantic hurricanes. If the recent hurricane that struck Puerto Rico is included it raises that number to three. Hurricanes are rare in the Atlantic Ocean south of the equator. Many tropical lows develop in this region, but Hurricane Catarina, in 2004, was the first and only tropical depression in history to reach hurricane status in this part of the global ocean. Heavy hurricane winds threaten the coast. The northern Pacific Ocean is divided into two regions for naming severe cyclonic storms. North of the Equator and East of the International Date Line at 180 degrees, they are hurricanes. The eastern Pacific hurricane season begins earlier than does the Atlantic season. It runs from May 15 through November. In 2017, the first system to reach tropical storm status was Adrian and developed on May 9, the earliest on record. However, it did not reach hurricane strength. The northwest Pacific region extends from 100 degrees East to the International date line. In this region the storms are referred to as typhoons. Most of the worst typhoons on record have occurred in the 21st Century. This is particularly true when fatalities indicate the severity. The Philippine Islands lie in the path of these storms. Between five and ten tropical cyclones make landfall in the islands each year. Haiyan, in 2013, was the most severe on record, taking more than 6000 lives and displacing several million people. The local name for the storm was Typhoon Yolanda. The first typhoon of 2017 formed on January 7. Typhoon Noru formed in July and became a Category 5, or super typhoon. Climate change, and particularly warmer water in the Pacific Ocean are most certainly contributing to the increased severity of the storm. The prognosis is for these marine storms to become more intense with time. Categories: Climate Change, Extreme weather, Hurricanes | Tags: #climatechange, Co2 and Global Warming, Hurricanes | Permalink. Soft shorelines create spaces for the water to go. September 18, 2017 ——With the recent flooding in Texas and Florida, it is evident that the rising seas from climate change will affect us by chronic flooding, which will become more frequent. 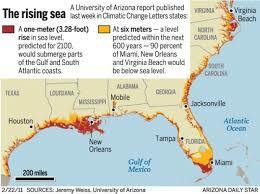 There will be continued flooding and devastation from weather as our climate and seas warm up. Scientist have worried for years that melting sea ice and ocean warming would cause a rise in sea levels, extreme weather and more severe and frequent hurricanes. What is our government’s responsibility? Do we continue to spend our tax dollars on mitigation, cleaning up the aftermath of the increasingly destructive power of storms? Do we continue to rebuild coastal areas that are vulnerable to climate change or do we have a responsibility to reconstruct cities and coastal areas against the coming vulnerability of our changing climate? William V. Sweet, Scientist with the National Oceanic and Atmospheric Administration stated, “Once impacts become noticeable, heavy rains and extensive flooding are going to be upon us quickly. 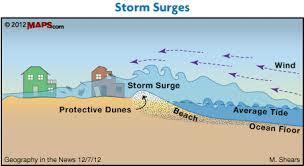 It’s not 100 years off anymore.” Higher seas mean higher storm surges. As seas rise in an area, the coastal creeks and marshes will rise and bring salt water inland. Many coastal trees will be affected by the saltwater rise. What are our choices? Keep spending tax dollars on rebuilding coastal properties or rebuild naturally to reduce the impact of rising seas. A soft shoreline maintains the natural dynamics of the shoreline, with a healthy movement of the sand and improving habitats of sea life. It allows the coastline to do what it does naturally, without the build-up of asphalt and man-made dwellings. A living coastline has natural barriers, vegetation and salt marshes that make it a stronger buffer, against flooding, but also moves and changes as any undeveloped shoreline would. Obama Presidential Adviser, John Holdren, said of the challenge of climate change, “We will end up with a mix of prevention, adaptation and suffering. It is for us to determine the ration.” There are consequences of inaction! What we’ve done with much of our coastal lines to deter flooding is to construct impervious surfaces and blockages to dissipate the wave energy. But there are natural designs that absorb water from storms and channel it back into nature, creating spaces that navagate the water naturally. The current method of deterring sea wave energy are hard structures. Hard structures, such as sea walls, deflect the wave energy to adjacent areas, redirecting the wave to a neighboring property. These properties witness a greater destructive energy than the original destination of the wave. Walls can fail and waves can erode sand at the base of the seawalls. Walls can also be destructive to the surrounding flora and fauna, which may be preventing a more serious flooding disaster. Hard structures won’t save our cities from rising seas! The better approach according to Rachel Gittman, Ecologist, is to create living shorelines. 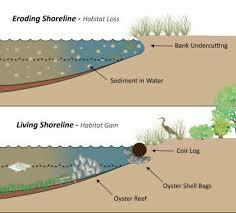 A living shoreline is site specific according to the natural habitat of the location. She states that for calmer waters, build water absorbing marshes with sill-like ledges made of rocks, oyster shells or coconut fiber logs. 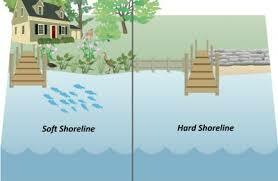 A shoreline may also benefit from planting mangroves, which firmly anchor the shoreline in place. Cities affected by the rising waters. By 2100, 490 communities could be chronically flooded including Boston, L.A. and most of NYC. Communities will have to decide what will be best for them, flood walls, living shorelines, elevating structures or to retreat. Cities that are below sea level probably won’t be benefited from natural shorelines. In the meantime we need to change our behaviors to slow down climate change! Categories: Building Green, Climate Change, Hurricanes, Islands and Climate Change | Tags: #climatechange, Declining Sea Ice, Global Warming, living shoreline, Sustainable energy | Permalink.